Kentucky Could Become The Only State Without A Clinic That Performs Abortions A federal trial pits the last remaining clinic providing abortions in Kentucky against the state's Republican administration, which says the center failed to meet state health standards. 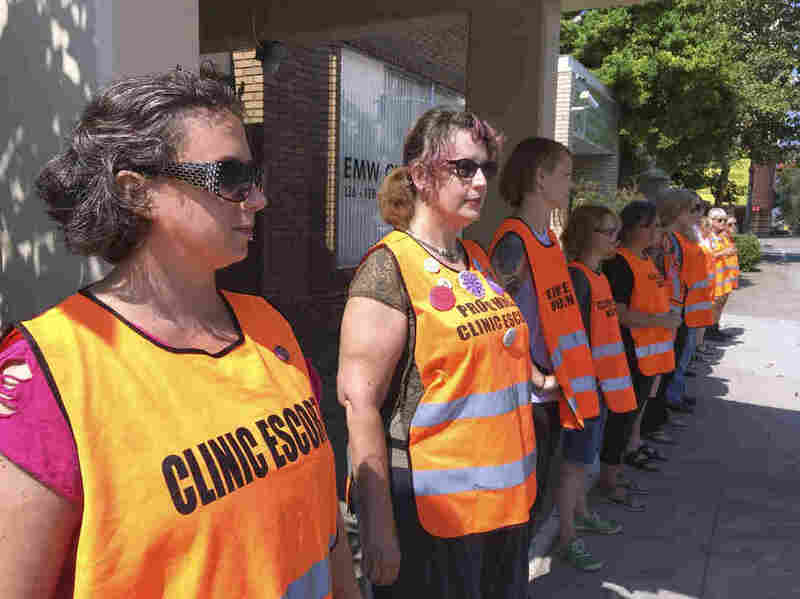 Volunteer escorts line up outside the EMW Women's Surgical Center in Louisville, Ky., ahead of a large anti-abortion-rights protest earlier this summer. Republican Gov. Matt Bevin tried to shut down the EMW center earlier this year after his administration told the clinic that it was failing to meet state health regulations requiring clinics that provide abortions to have transfer agreements with local hospitals and ambulance services in case of medical emergencies. Bevin's administration notified the clinic in March that its agreement had been deemed insufficient. In response, lawyers for the EMW center filed a federal lawsuit claiming the administration's complaint had come "out of the blue." The clinic at one point came within days of closing, but the administration and clinic later reached an agreement allowing it to stay open while litigation is underway. The center has been the site of several recent protests by anti-abortion-rights groups seeing the potential for both a real and symbolic victory for their cause. "The stakes are very high in our challenge to restrictions in Kentucky that would close the last abortion facility in that state," said Brigitte Amiri, an attorney with the American Civil Liberties Union, which is representing the women's clinic. 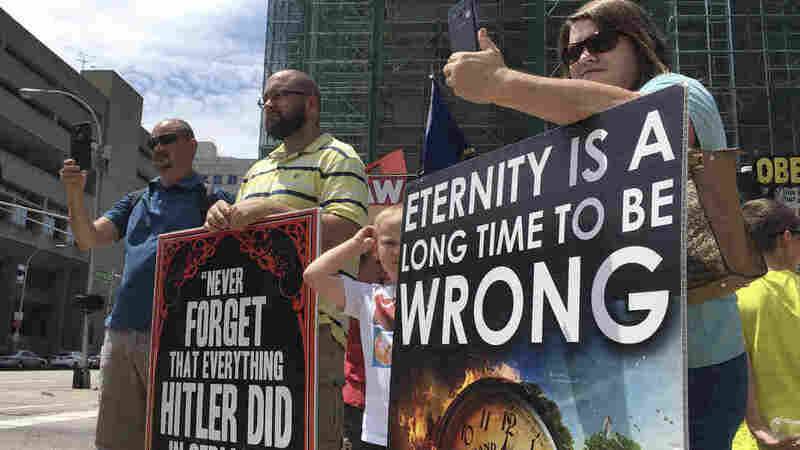 Abortion rights opponents gather during a rally in downtown Louisville earlier this summer. A federal judge issued an order to keep protesters away from a "buffer zone" outside the EMW Women's Surgical Center. Amiri argues the 2016 U.S. Supreme Court ruling Whole Woman's Health v. Hellerstadt, which struck down a Texas law requiring surgical-grade facilities at clinics that provide abortions and abortion providers to have hospital admitting privileges, is relevant in Kentucky as well. Amiri said the state law requiring hospital transfer agreements would amount, in effect, to a ban on abortion in Kentucky. "So when weighing the benefits of the law against the burdens — which the Supreme Court requires states to do — it's very clear that what Kentucky is doing is blatantly unconstitutional," Amiri said. Don Cox, a Louisville-based attorney representing the EMW center, accuses Bevin's administration of creating arbitrary rules that are rooted more in ideology than in public health research. "They could just as well say everyone who wants an abortion has to wear a red handkerchief," Cox said. "They've got as much proof for that being helpful to women's health. The Bevin administration will be making the opposite argument in court: that such regulations are necessary to ensure the cleanliness and safety of facilities providing abortions, and to protect the women seeking them. Bevin spokeswoman Amanda Stamper said in a statement to NPR that the administration is "working diligently to protect the health, welfare, and lives of women in Kentucky," describing those requirements as, "important measures for ensuring women have the proper life-saving procedures in place in the event of an emergency." It's an issue that is likely to continue to come up as states pass legislation known as TRAP laws, for "targeted regulation of abortion providers." The American Congress of Obstetricians and Gynecologists weighed in on the issue in a 2014 opinion, writing that rules passed in some states "under the guise of promoting patient safety, single out abortion from other outpatient procedures and impose medically unnecessary requirements designed to reduce access to abortion." Planned Parenthood, which no longer performs abortions in Kentucky, has also joined the case. In a document filed last week, lawyers for Planned Parenthood argue that Bevin's administration is deliberately trying block women's access to abortion by threatening to block funding to the University of Louisville Hospital system if it cooperates with abortion providers. Stamper, Bevin's spokeswoman, said in a statement that the governor's staff had made "no threats pertaining to state funding. Planned Parenthood's attempt to misconstrue the documents simply reflects its desire to divert attention from the weakness of its case," Stamper said. If the EMW Women's Surgical Center's lawsuit is successful, abortion rights advocates say it would also pave the way for other Kentucky clinics to resume or begin providing abortions.